While largescale energy infrastructure upgrades can be costly and time-consuming, there are cost-effective measures hospitals can take to optimize their existing energy use. Rather than spending large sums of money on pricey infrastructure projects, optimization focuses on low-cost measures and uses existing equipment to make them as efficient as possible. Optimization is an ideal place to start for most hospitals. It requires limited capital investment, provides high ROI and is the environmentally responsible choice. Here’s how your hospital can start optimizing energy performance without costly expenditure on capital improvements. The first thing a hospital should do to optimize energy use is to compile benchmark data. Having a complete understanding of the ways your facility uses energy will help differentiate high priority areas that require the most improvement and allow you to track progress over time. In order to begin tracking and measuring energy performance, you need to collect and analyze performance data from key building systems. Take the time to document what the systems are, how they are operating, and when they are operating. Not sure where to start? You can begin with air handling units, chilled and hot water systems, compressors, and patient rooms. By tracking energy patterns in these places, you’ll discover operational energy-saving opportunities in areas such as the building schedule, equipment maintenance, and pump sequencing. Sometimes it’s the most basic actions that make the biggest impact. 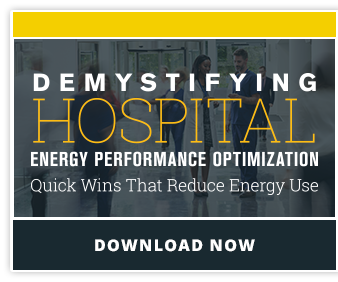 There are small adjustments you can make to optimize your hospital’s energy performance that typically go unnoticed or are ignored. Here’s an example: balancing air and water systems. When was the last time you performed a proper adjusting and balancing of HVAC systems? This is a simple step that can enhance indoor air quality and efficiency. Another small change is adjusting thermostats for seasonal changes and occupancy. As common-sense as it may sound to adjust the heating and cooling schedule in response to building occupancy and changes in the weather, many facilities don’t take the extra step of developing a temperature control schedule. Many small but practical adjustments can add up to significant energy savings. If your mechanical equipment and piping systems are wasting money and energy, you probably don’t need to replace or upgrade the entire system. Retrofitting your building or facility with mechanical insulation is a way to upgrade quickly to the energy saving levels that will drop utility bills while enhancing the longevity of your building components such as equipment, plumbing infrastructure, and more. The technological advances of retrofitting with the highest-quality mechanical insulation can save hospitals hundreds of dollars in annual energy loss. Hospitals don’t need to make large, expensive capital investments to optimize their energy performance. There are simple, cost-effective ways that hospitals can optimize their existing energy infrastructure while helping their line and meeting their commitment to health.